Admit it! Nothing is perfect. 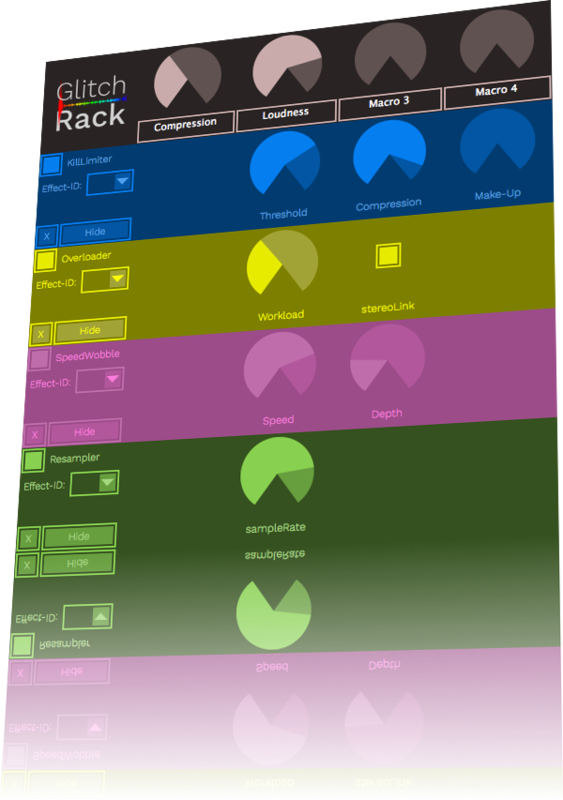 The GlitchRack is a collection of effects which aim to get the worst out of your sound. Sprinkle your audio with glitches and manipulate it to extremes that you would usually try to prevent. The GlichRack is aimed at musicians that like mistakes and see them as opportunities. The VST effect plug-in comes with a wide variety of unusual effects. Some of them might seem familiar, but where most common effects stop, the GlitchRack is only getting warmed up. Bit reduction to the extreme, resampling to the worst quality, limiting to the hardest brick wall and much more. The GlitchRack is a digital sound blender that destroys every incoming signal until it's unrecognizable. The KillLimiter: Limiting to a brickwall that has never been harder. The ChunkInverter: Chopping your audio and reverse it. The CrazyLeslie: Switching stereo channels faster than any speaker can spin. The Bitifier: Decrease Bit-Depth that even a C64 would sound like a high resolution speaker. The TapeStop: Old but gold. stop your audio with that unforgotten slowing and downpitching sound. The Resampler: Samplerates so low, that no soundcard can be bothered to use these. The SpeedWobble: Playback-speed can be a fickle thing. The Overload: A computer can only take so much. It's just a matter of time, when it drops out. (Of course your machine will not be harmed, this is just a simulation). In this little demo you can hear the ChunkInverter, the Resampler and the KillLimiter at work. All three first at their own, then thrown together.